The building in Navi Vasti locality collapsed at around 9 am, Regional Disaster Management Cell chief Santosh Kadam told reporters here. MUMBAI: At least three people were killed and seven others sustained injuries when a seven-year-old four-stories building collapsed in Bhiwandi on Friday morning. The building in ‘Nayi Basti’ area on Bhiwandi-Kalyan road was said to have been constructed illegally on the forest land and the owner of the building has been arrested, said the police sources. 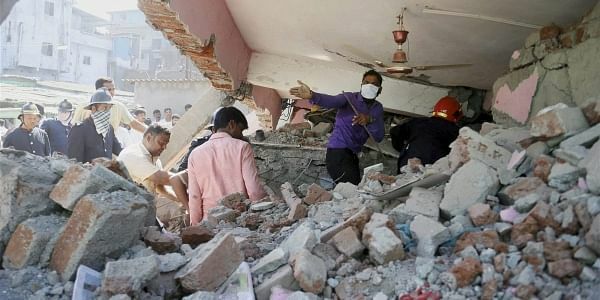 The building was occupied by seven families and not many of them were in the building when it fell at around 8.30 am in the morning, said Asmita Nikam, district disaster management control officer. The body of Ruksar Yakub Khan (19) was recovered by the rescue operators from the site, while two others – Ashfaq Mushtaq Khan (38) and Zebunnisa Rafiq Ansari (61) died in the hospital during treatment late in the evening. The rescue operations are still on and eight to ten people are still feared to have been trapped under the debris, regional disaster management cell chief Santosh Kadam has said. Five others who have been rescued are admitted to the state-run Indira Gandhi Memorial Hospital, he added. The building was in a dangerous condition and fell on the adjoining small building--increasing the possibility of a larger number of people trapped, said DYSP Manoj Patil adding that narrow roads are posing difficulty in conducting the rescue operations. National Disaster Response Force (NDRF) teams have been conducting the rescue and relief operation along with fire-brigade personnel from Bhiwandi, Thane, Navi Mumbai, Kalyan and Mumbi Municipal Corporations.